Disable Facebook notification emails: By default Facebook is setup to email you whenever someone posts to your wall, pokes you, or whatever. I have disabled all emails from Facebook. All of these notifications can be seen within Facebook and you do not need them in your email. Instructions on how to disable them. Limit Instant messages: I limit my buddy list to only specific people. Usually only work-related contacts. Anyone else can contact me through email. Disable sound notifications: I turn off sound notifications for instant messages and emails and opt for visual notifications (to an extent). Besides distracting sounds beeping at me all day, I usually listen to music or podcasts and sound notifications would get annoying. Disable pop-up notifications: I use Pidgin for instant messaging and I only use the taskbar highlighting when I receive an IM. For emails, I use Scott’s Gmail Alert which displays an icon in your system tray. Avoid social network add-ons/plugins: These are such services as Gist, RockMelt, and Rapportive. 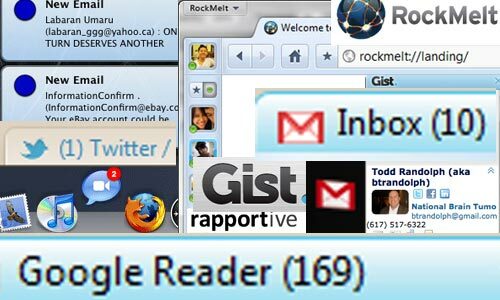 These add-ons put your social network contacts “conveniently” in your web browser or next to your Gmail. Doing web design, I am working in the browser all day long. I do not need to know when my friends are online or what they are doing. These are just a few things to help with avoiding distractions and staying focused.